Mahāyāna in India became relevant and quite influential, laying the foundation for a mature Mahāyāna that came of age in a feudal age and which in due time gave rise to Vajrayāna. Here I want to take a brief look at how and why this occurred as well as the outcome. We should take a moment to consider Khotan as it seems to have been a frontier land that especially hosted the Mahāyāna away from its motherland. Khotan is located in the south west corner of the Tarim Basin at 37°06′ N 79°56′ E (see Google Maps). 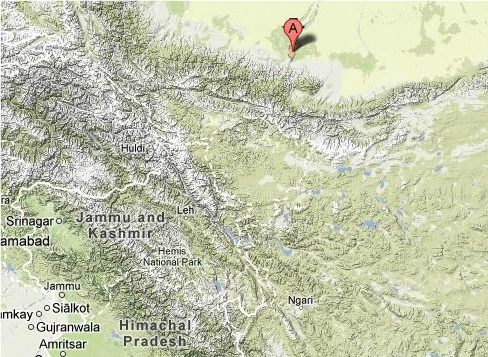 As the map shows it is located on the frontier of Tibet and is on the far side of the Himalayas and Pamirs. It is not so far from Leh in Ladakh (for my description of contemporary Leh see here). Nevertheless, it was a tough hike from Khotan to the plains of India. The loss of public revenue is relevant to the direction the Buddhism took. The decline of trade can be traced back before the final demise of the Guptas. As Burjor Avari notes, “The fall of the Western Roman Empire and the disappearance of the flourishing trade with Rome meant a certain definite decline from the end of the fourth century in the value and volume of Indian international trade. One indicator of this was the paucity of metallic money from the late Gupta period onwards.”5 Of course trade did not entirely collapse, though the debasement of coinage and the issuance of land grants that likely resulted from declining trade presumably led to issues with funding Buddhist monasteries as was done before. Ronald M. Davidson in the Handbook of Oriental Studies Esoteric Buddhism and the Tantras in East Asia describes the effects of the Gupta collapse in the sixth century on Buddhists and also how they responded. To begin with, whole areas became inaccessible to Buddhists, such as the Kṛṣṇa River Valley, which was home to early Buddhist communities such as Amarāvatī and Nāgārjunakoṇḍa, owing to hostile Śaivaite forces. A number of monasteries in north India, including the famous Nālandā in modern Bihar state, effectively became feudal fortresses with the abbots overseeing taxation and policing over their territories (maṇḍala). Davidson also suggests that female participation in the religion declined owing to “institutional negotiation with non-Buddhist values”, eventually leading to the end of bhikṣuni ordinations in India around the end of the first millennium. This also brings to mind the brahmanization of Buddhism, which is a theory proposed by Bronkhorst and discussed in an earlier post (see here). 1 Legge suggests this is Bannu in the Punjab. 2 Jan Nattier, The Bodhisattva Path: Based on the Ugraparipṛcchā a Mahāyāna Sūtra (New Delhi, India: Motilal Banarsidass Publishers, 2007), 175. 3 Daniel Boucher, “Dharmaraksa and the Transmission of Buddhism to China” in Asia Major, Volume 19, part 1/2,2006, 36-37. See here. 6 Ronald M. Davidson, "Sources and Inspirations: Esoteric Buddhism in South Asia" in Handbook of Oriental Studies Esoteric Buddhism and the Tantras in East Asia (Leiden, The Netherlands: Brill, 2011), 21. Wonderful article-- I am eagerly looking forward to the next installment. Have you read Joseph Walser's book Nāgārjuna in Context: Mahāyāna Buddhism and Early Indian Culture? I think you'll find it relevant to your investigations. Yes, indeed I have read it. It is quite fascinating. His thesis is in line with the archaeological record as I understand it. Wonderful work.